How do I buy a WhoZaGood Franchise? 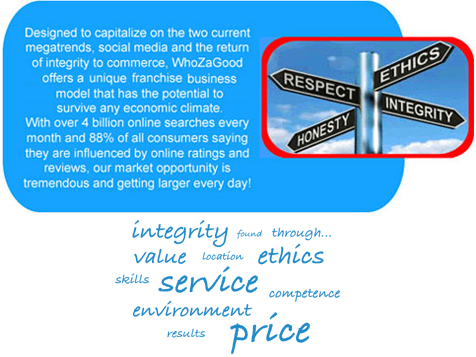 WhoZaGood is a search, rating, social media franchise and matching platform like no other . . . Our patented technology is poised to be the Next Generation of the way businesses and consumers connect and interact with each other in the U.S. and Canada and eventually around the world. The evolution of commerce is under way! Designed to capitalize on the two current megatrends, social media and the return of integrity to commerce, WhoZaGood offers an entrepreneurial franchise business model that has the potential to survive any economic climate. With over 4 billion online searches every month and 88% of all consumers saying they are influenced by online ratings and reviews, our market opportunity is tremendous and getting larger every day! Open WhoZaGood in any of these available states: AL, AK, AZ, AR, CO, CT, DE, FL, GA, ID, IA, KS, KY, LA, ME, MA, MI, MS, MO, MT, NE, NV, NH, NJ, NM, NC, OH, OK, OR, PA, SC, TN, TX, UT, VT, VA, WV, WY, DC. The Opportunity You've Been Looking For is Looking For You! Are you considered a leader in your industry? Are you respected for your ethical business practices and fair treatment of consumers? Do you often wish you could raise the standards in your industry? Do you have a network of established industry contacts gained by years of doing well and doing good? Our ideal candidate will answer "yes" to all of these questions. It's time to lean how all of your hard work can pay off! WhoZaGood is a search, rating and matching platform like no other . . . Our patented technology is poised to be the Next Generation of the way businesses and consumers connect and interact with each other in the U.S. and Canada . . . eventually around the world. The evolution of commerce is under way! An Opportunity Like No Other . . .
A business opportunity where you can participate according to your own schedule in a board membership style engagement, where your commitment is based on your lifestyle, where you can stay in your current position while building this business for yourself. 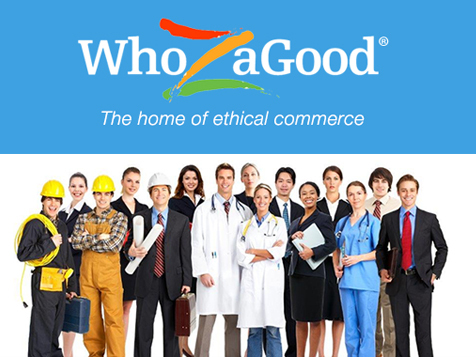 If appointed as a WhoZaGood Managing Director, you will set the standards in the industry of your choice, assembling a team of Advisory Board Members and offering the public a reliable, ethical system for connecting consumers and businesses that have the same values. WhoZaGood’s patented functionality uses a combination of consumer ratings and predictive analytics to provide a quantitative business rating site different from all others. Territory includes the right for all of U.S. and Canada. This is an exciting opportunity for someone who is passionate about their career industry and who wants to make a significant difference in shaping the future of that industry. With only one Managing Directory appointed per industry for all of the US and Canada, our ideal candidates must be a Champion of Integrity and an Ambassador of Ethics, committed to transparency and fairness in consumer practices. WhoZaGood is looking for candidates who meet the following requirements . . . This is a ground floor opportunity that could allow you to help shape your industry and this dynamic, world-class company WhoZaGood! This opportunity is not currently being offered or directed to (and a franchise will not be sold to) residents of California, Hawaii, Indiana, Illinois, Maryland, Minnesota, New York, North Dakota , Rhode Island, South Dakota, Washington, Wisconsin, or the province of Ontario in Canada. WhoZaGood is not currently active in our directory, but here are some other recommended selections for you to explore.